Just a few short years ago, social media companies were frantically acquiring, and filing-for, patents as they geared up for their IPOs. The spotlight on social media and networking companies has diminished a bit recently with the emergence of new sectors and technologies that have caught the media’s attention, such as for example, cryptocurrencies, medicinal cannabis, and artificial intelligence. However, there continues to be quite a bit of patenting activity by the major social media companies. 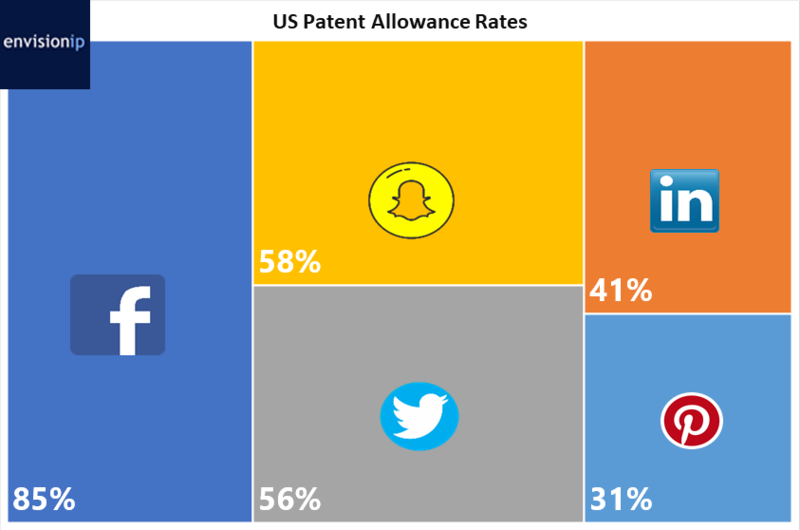 Envision IP took a detailed look at the US patent portfolios of Facebook, LinkedIn, Twitter, Snap, and Pinterest to understand the patent strategy and positioning of these companies in recent years. At a high level, Facebook continues to dwarf its peers in terms of sheer size of its US patent portfolio. Facebook owns over 4,200 issued US patents, and currently has over 2,000 published US patent applications. At the opposite end of this spectrum, Pinterest owns a mere 9 US patents and has 16 published US patent applications. 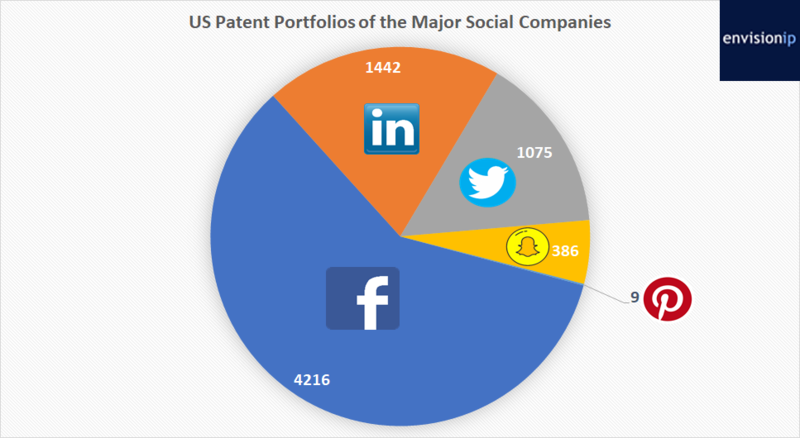 LinkedIn, which was acquired by Microsoft in 2016, owns over 1,400 US patents, followed by Twitter with 1075 US patents, and Snap with nearly 400 US patents. One important note regarding these patent portfolios is that they all, except for Pinterest, have a very common theme – each company acquired a significant number of patents from IBM at some point in time. For example, Facebook acquired about 750 IBM patents in 2012, LinkedIn acquired nearly 800 IBM patents in 2015, Twitter acquired over 900 IBM patents in 2014, and Snap acquired nearly 250 IBM patents in 2015. While public patent assignment data shows that Pinterest has not acquired any patents from IBM, the company made a small acquisition last year of 5 patents. The below chart shows the percentage of each company’s current US patent portfolio that is organically grown, versus acquired from third-parties. Notably, Facebook is the only company in the group where organic patents (i.e., those which were filed-for directly by Facebook) comprise a majority of the patent portfolio. 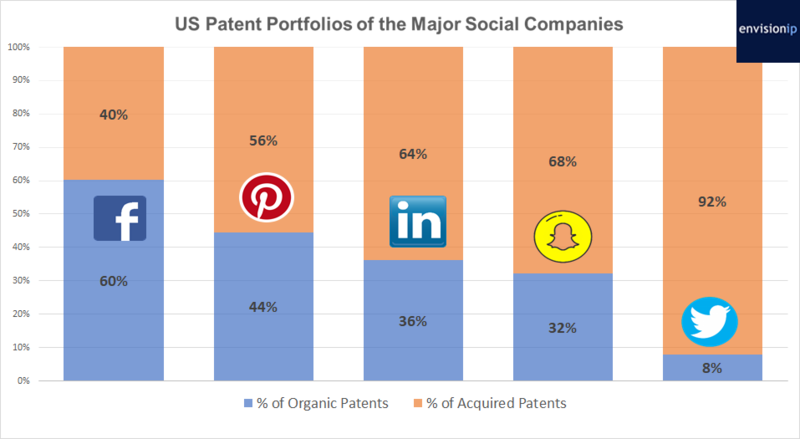 While Facebook, LinkedIn, and Snap have appeared to continue to grow their patent portfolios via organic filings and additional acquisitions over the years. Twitter’s US patent portfolio has remained relatively stagnant following its acquisition of the 900 patents from IBM. The company’s total portfolio has 1,075 US patents, where only 86 of these patents, or 8%, resulted from Twitter’s own patent filing efforts. The remaining 989 patents, or 92%, were acquired from various third-parties. In terms of new patent application filings in recent years, only Facebook appears to be placing an emphasis on continued research and development and innovation, at least when measured by the number of patent applications the company has filed. 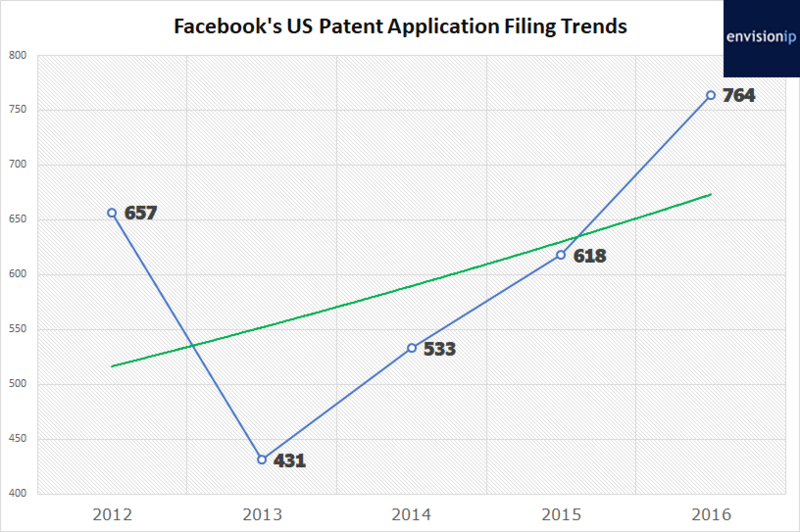 From 2012 through 2016, Facebook has shown a generally upward trend in new patent application filings, as shown in the chart below. US patent applications typically become publicly available 18 months after their earliest effective filing date, thus, the patent filing data for Q3 2017 through 2018 is not complete. However, so far for 2017, 369 Facebook patent applications have published, and 32 have published for 2018. In stark contrast to Facebook’s pace of filing new patent applications, the remaining companies in our group have low double-digit filings, except for Pinterest which has filed a mere handful of patent applications over the years. To date, for 2017, interestingly, despite the historical lack of filing its own patent applications, Twitter has filed 13 patent applications. Snap has filed 9 patent applications, and Pinterest has filed 4. Following LinkedIn’s 2016 acquisition by Microsoft, any new patent filings appear to be assigned to Microsoft Technology Licensing LLC, thus it is unclear if these new patent applications in Microsoft’s portfolio were generated from its LinkedIn division. In addition to filing trends, we analyzed the overall allowance rates for each company’s US patent portfolio. The allowance rate is determined by taking the total number of issued patents, and dividing that value by the total number of applications filed (based on published patent application data). The allowance rates calculated below are for the company’s entire portfolio, including patents acquired from third-parties. Facebook has a staggering 85% allowance rate, followed by Snap and Twitter with over 50%, LinkedIn with 41%, and Pinterest with only 31%. Out of the over 7,000 US patents collectively owned by these companies, 420 are listed in class 705 for “Data processing: financial, business practice, management, or cost/price determination”, which has been coined the “business methods” classification. 212 of these business methods patents are owned by Facebook, 107 by LinkedIn, 85 by Twitter, and 16 by Snap. These companies, ex-Pinterest, appear to have done an impressive job with navigating the waters when it comes to business methods patent applications. However, the issuance of a business methods patent can cut both ways, as many lower courts have ruled such patents to be invalid, while others have decided validity on a case-by-case basis. Thus, the enforcement and licensing value of business methods patents may likely be limited until there is more clarity passed down from the courts. In summary, Facebook clearly is the dominant social media company when it comes to the size of its patent portfolio, and it is aggressively filing new applications at a growing year-over-year rate. Aside from Facebook, Snap and LinkedIn have grown their patent portfolios organically to some degree, while building an initial foundation with large patent acquisitions from IBM. Twitter, on the other hand, while having a relatively large patent portfolio, has done relatively little in terms of organic patent growth after acquiring the majority of its patents from IBM. Pinterest’s patent portfolio is almost non-existent, which is interesting given the rumors of a potential IPO in 2019. 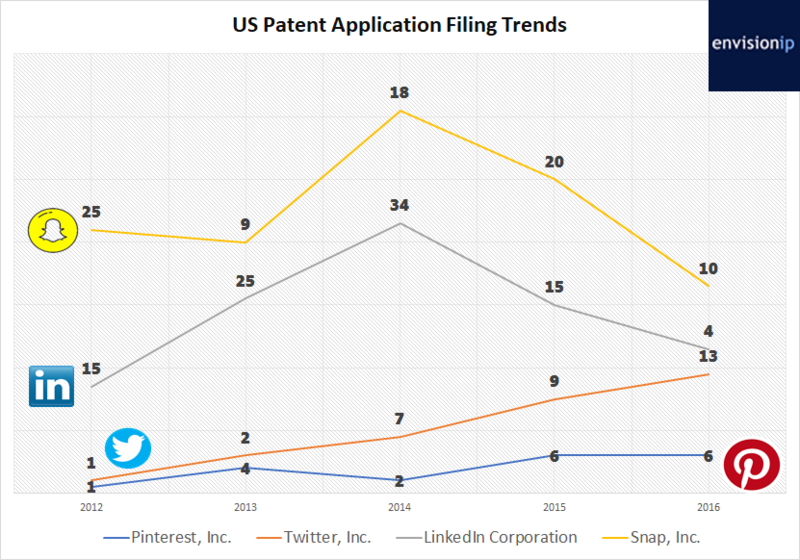 We would not be surprised if Pinterest bolstered its patent portfolio in the coming months leading up to a purported IPO, which has been a similar trend set by Facebook, Snap, and Twitter. Pinterest’s lack of patents could make it vulnerable if it is sued for patent infringement by an operating company or a competitor, as it appears to have virtually no defensive patents that could be leverage for counter-suit.